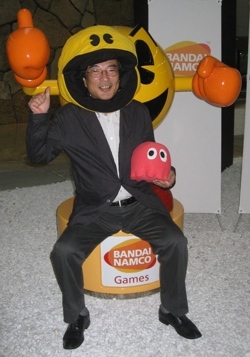 Toru Iwatani, 55, is the designer of Pac-Man, the classic video game that virtually kick-started the world market for the video-gaming industry. Released by Namco in Tokyo on May 22, 1980, Pac-Man made history as the first video game that appealed to both genders and to all age groups. Idea-man Iwatani, programmer Shigeo Funaki and sound and music whiz Toshio Kai developed the yellow dot-eating Pac-Man and the four colorful ghosts into such adorable creatures that kids and adults immediately ate them up. Even today, people around the world still love the game. When Google uploaded its Pac-Man Doodle to celebrate its 30th birthday on May 21, an estimated 505 million people played it within 24 hours. Clearly the leader of the “pac,” Pac-Man has been mentioned several times in the “Guinness World Records” including being listed as the Most Successful Coin-Operated Game in 2005. Last Thursday, Iwatani attended a special ceremony to pick up his 2005 Guinness World Record certificate at the NLGD Festival of Games in Utrecht, The Netherlands. Since 2007, Iwatani has been a professor in the Department of Games at Tokyo Polytechnic University, where he’s playing with the idea of the “win-win” situation and showing students that making people happy is what games and life are all about. A good game is easy to understand. The player should immediately get the point. When you watch golf for the first time, you know that the ball is supposed to go into the hole. It’s the same with Nintendo’s Super Mario Brothers or a pinball machine: You know what to do. Making people laugh must be taken seriously. Since I was a boy, I loved itazura, which means coming up with mischievous ideas. I was always making jack-in-the-boxes to surprise others. I’d glue plastic bugs on long springs so they’d jump out of bags. I’d tie long weeds together so my friends would get their feet stuck in them. I still do anything to get a laugh. Fun first, last and in-between! Creating takes time. Even though game developers work in turbo time, companies can be impatient. I understand both sides. Making a great game requires maybe 100 people and two years of time. How many companies can afford that? Yet games are like good wine or Scotch: They need plenty of time to develop flavor. If you want to know the state of the world, go to a tachinomiya (standing bar). I only go to cheap places where I see people as they really are — both lost and happy. Liquor and information flow freely in such places, and we all have fun. Give others more fun and more kindness than they expect. In Japan, that’s called itareritsukuseri and it’s Pac-Man’s message. To make a great product, creators need to have empathy. They must love people and want to make them feel better. With Pac-Man, we thought a lot about what it feels like to be chased. We didn’t want to torture people, we wanted them to feel only the thrill. There’s always a possible escape and that’s the fun! Any piece of hardware turns into a portal to magical places once its spirit is filled with games. Mobile phones, computers, almost everything can have games. If the design of the actual hardware could be more playful, then it would be even better. All humans are game players. The Dutch historian Johan Huizinga wrote in his 1938 book, “Homo Ludens” (“Man, the Player”) about “the play element of culture”; how play was essential in the development of human culture. We need to satisfy our strong curiosities to fulfill our hearts. The best game plan to life is to get as much information as possible, as fast as possible. I sleep 90 minutes a day. By 3:30 a.m., I’m up zapping TV channels. I spend 5 seconds on each one. Later I move to the computer and surf. I cover a lot of topics. If you are open and friendly, results will come to you later. Just do your job well, and you will do well. If you worry about the quality of your performance, you can probably make good products. Japanese worry a lot, so we prepare a lot, too. We’re born for monozukuri (producing things with skill and precision). Even if you don’t want to be famous, it might still happen. 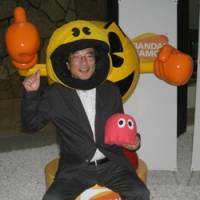 Programmer Funaki and sound creator Kai both quit Namco after we made Pac-Man, so my name became more known than theirs. Too bad! My idea of life is not to be a burden to anyone and to help others. At home I wash the dishes, hang the futon, shop and cook simple meals. When you hear something that sounds right, ask 10 people if it is. I tell my students to question everyone and everything. A happy ending is what everyone wants. It’s best when we know the ending right at the beginning. “Mito Komon,” the Japanese TV series, is like that. At the end of every episode, the bad are punished and the good rewarded. Empowering the weak is a strong motivation to work harder. I want to create games that include everyone in the fun, even people who have never played before. Maybe they don’t have money or there is no electricity where they live, or they don’t have the physical attributes necessary for today’s games. Blind people and those with limited use of their bodies also need games. I never had a goal in my life, but somehow I’ve scored. Trusting the natural flow of the universe is best. A big mouth doesn’t fit into our small world. We can’t be like Pac-Man in real life. Unless we listen more and talk less, we will get eaten up or kicked out of the group. Once your heart is blue-collar, no matter what you wear, you’re always hardworking. I had a part-time job as a construction worker in my high school days because I loved rock music and needed money to buy records. I’m a worker for life. Think of others first and then the world will maybe think of you. If not, that’s OK, too.